It's a bit warmer here in Pittsburgh - that makes us happy. The icicles melted away, the snow melted away. Unfortunately, this past Sunday it was gray and gloomy and rainy. 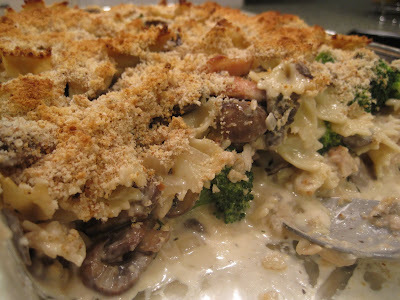 The perfect weather for another hearty, comforting casserole from the Cover & Bake cookbook. 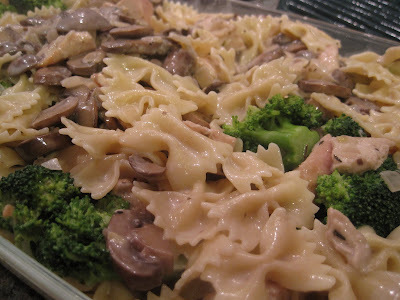 The choice: Baked Penne with Chicken, Broccoli, and Mushrooms. As usual, we made modifications to the recipe! 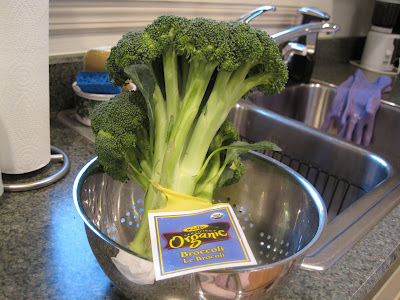 SP bought organic broccoli, which was on sale at Giant Eagle Market District this past weekend. It was lovely - so green and fresh looking, none of those brownish/darkish colorings on the florets. Yum! As you may have guessed, we omitted the garlic. We discovered that we didn't have 3/4 lb of penne. We had lots of rigatoni, spaghetti, and bow ties - so we used 3/4 lb bow ties. 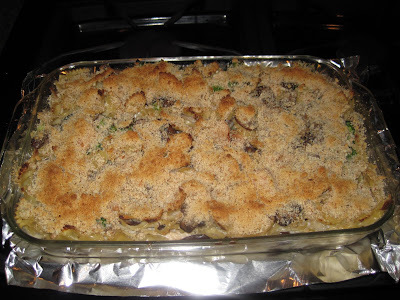 Instead of cremini and porcini mushrooms, we used cremini & regular button mushrooms. We didn't cube our chicken and then cook it in a frying pan -- we baked it in the oven and then cut it into one inch cubes. We used dried, not fresh, thyme. The first step is to cook the broccoli for about 1 minute in boiling water. Remove it with a slotted spoon and let it drain & cool. Using the same pot, return the water to boiling and cook the pasta until al dente - don't cook it too long or else it will turn into mush after you bake the casserole. Drain the pasta and toss it with 1 tbsp olive oil. 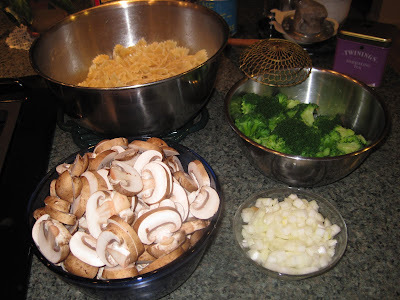 Add the remaining 2 tbsp olive oil to the emptied and dried pot in which you cooked the broccoli and pasta. Add the cremini and cook until browned around the edges, about 10 minutes. Add the onion and cook until it just begins to brown, about 8 minutes. Add the garlic & thyme. Add the flour and cook, stirring constantly, until golden, about 1 minute. Slowly whisk in the wine and dried porcini with reserved soaking liquid (we added about 1/2 cup water). Cook until the liquid is almost evaporated. Slowly whisk in broth and cream. Bring to a simmer. Add the chicken and cook until the chicken is no longer pink. Remove from heat and stir in Asiago & back pepper. 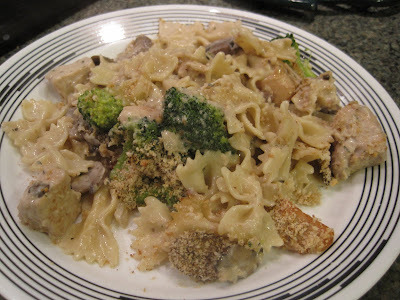 Add the pasta and broccoli. Stir to combine and transfer to 9x13 inch baking dish. 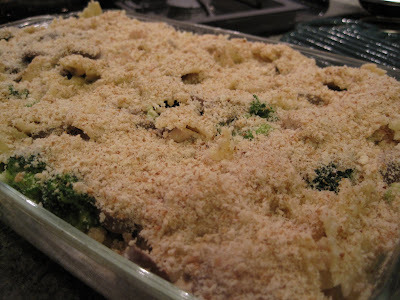 Sprinkle with bread crumb topping (see below) and bake at 400 until bubbling and topping is lightly browned, about 15 minutes. Process bread & butter in food processor until coarsely ground; set aside. Way back in July, we bought a loaf of Wonder Bread. We never eat that stuff. It was for visiting nephews, but they didn't eat the bread. We ended up toasting it all and processing it into bread crumbs which we divided into plastic containers and placed in the freezer. Homemade bread crumbs! So we used a container of those breadcrumbs for this dish. Lately, we've been moving away from bottled cooking wine to cooking with 'real' wine. Saturday, we bought a bottle of Geyser Peak Sauvignon Blanc. It is regularly a $13 bottle of wine but was on sale for $9. It was pretty good wine! We were surprised, especially when SP went to open it and discovered it was a screw top bottle, not a corked bottle!! Is sauvignon blanc the best wine choice for a white cooking wine? I don't know. It happens to be my favorite white wine and the casserole tasted fine to us -- that's all that matters! This dish was delicious! Another great recipe from Cover & Bake.